This episode is about sharing the right side. It ends with a very big mistake by Black. Actually, every move here is wrong. I think that reading this is very instructive because it could help avoid similar mistakes in future. White 1: Bad. I constantly repeat to myself that moves like this should not be played automatically. The points a and 5 should be considered as well. These are points and they add up. At a was the best move locally. It makes Black crawling along the line gote, and White will not have to worry about the possibility of ko. Black 2: Bad. The best move locally is b. This is discussed in stupid moves. White 3: Natural connection. Good at least locally. Black 4: Sente. Locally good. White 5. Bad. White avoids a possible ko. I don't think that this luxury is affordable. White is behind. Black 6: Bad. Leaves a hole behind. White 7: Bad. White had to play at c and cut Black's stone off. Black 8: Bad. It just strengthens White. At c was a good move threatening to save the stones. 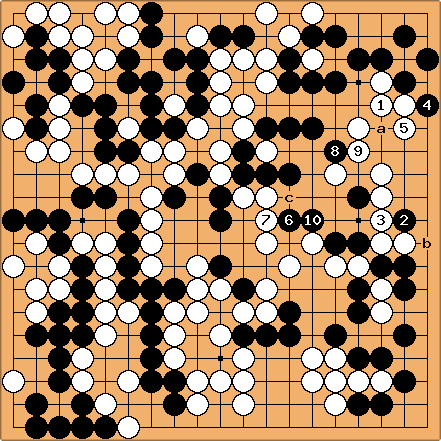 Black 10: An awful mistake that allowed White to cut at c.